In 1987 Mr. Ram Karan Cheta and late Mr. Kewal Khosla compiled a Havan book both in Hindi and English, as in those days they were not readily available. It was on April 9, 1989 that the Sthapana Divas of the Arya Samaj Society of British Columbia was celebrated in the presence of about 80 guests and the regular programme of weekly Havans took place every Sunday thereafter. As our membership increased, a Hindi school was opened. Hindi classes were held an hour before the Havan and the parents joined their children for the weekly Havans. Once the Constitution was ready, the Arya Samaj Society of British Columbia was registered as a religious body on August 19, 1991 and the first Annual General Meeting of the Society was held on September 20, 1992. Mrs. Gita Cheta was elected by acclamation as the first President of Arya Samaj Society of British Columbia. Under the leadership of Mr. Raghupal Singh, during his tenure as President for almost a decade, a considerable amount of money was raised towards the purchase of the property. 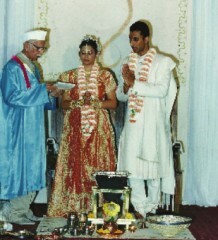 In October, 2007, the Society purchased a property at 6884 Jubilee Avenue, in Burnaby, British Columbia, with a donation from Madhu and Hari Varshney who also serve as officials of the Society. 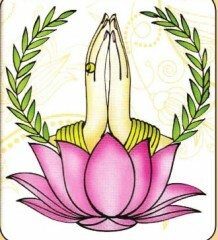 Regular Havans are held at this centre every Sunday from 10am to 12 noon with Yoga and meditation classes also. The Society also celebrates heritage and cultural programs and various Hindi festivals including Arya Samaj Sthapna Divas. The Society invites visitors from India and other countries to speak at functions. In 2011 and 2013, Swami Sampurna Nand Saraswati from India conducted meditation and yoga classes as well as Vedic preaching. 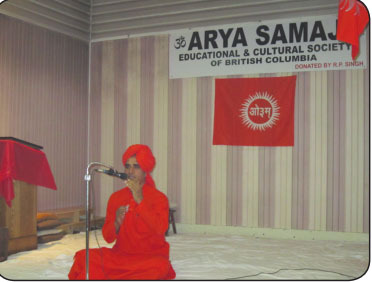 In early, 2013, the name of the Society was changed to Arya Samaj Educational and Cultural Society of British Columbia. मुस्लिम महिलाओं के अधिकार का हनन ? कही इस्लाम की आड़ में साम्राज्यवाद तो नहीं?